TORONTO -- A rare overnight session at the Ontario legislature that saw protesters and politicians gather for debate on a bill slashing the size of Toronto's council moved the government closer Monday to passing the legislation, which has thrown the municipal election in Canada's largest city into chaos. The Progressive Conservatives, who've been rushing to push through the reintroduced bill after a judge ruled an earlier version unconstitutional last week, said they expected to bring the matter to a final vote on Thursday -- about a month before Toronto goes to the polls. Premier Doug Ford said the overnight session was an indicator of the government's commitment to passing the controversial legislation, which shrinks Toronto's electoral map to 25 wards from 47 before the Oct. 22 election. "We were here last night, like tens of thousands, if not hundreds of thousands, of people around this province -- the police officers who have to work at night, the nurses who have to work at night and factory workers who have to work at night," he said. "We were fighting for the taxpayers of this great city." 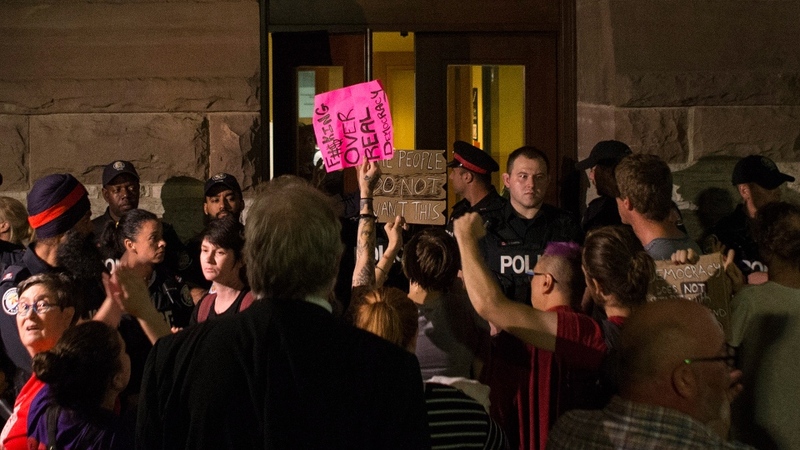 The midnight session had drawn crowds of protesters to the legislature. Some heckled Progressive Conservative politicians with cries of "shame, shame," inside the house until the Speaker cleared the public galleries. Others protested outside, chanting "Let us in!" and "Our city, not Ford's!" as police officers stood in front of the doors. By midday Monday, the majority had left, but protest signs remained scattered on the grounds outside the legislature. 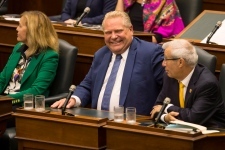 Ford, who has drawn much criticism for invoking a rarely used constitutional provision to forge ahead with his council-cutting plan, maintained that the majority of Ontarians supported him. "We are the only ones listening to the people -- not the disruptors, not the professional activists that we've seen over the last few days. And when you stand up for the people, the people will stand with you," he told the legislature. "The people are behind us, and I can tell you my friends, we will never, ever back down." Later in the day, the government downplayed suggestions there hadn't been enough debate on the bill, which is dubbed the Efficient Local Government Act. "We feel like we've heard from all sides," said government house leader Todd Smith. "We want to provide that certainty to the City of Toronto and the clerk there as quickly as we possibly can." The New Democrats, meanwhile, said the protests at the legislature indicated many oppose the government's move. "I would prefer to be here even longer debating this bill," said NDP Leader Andrea Horwath. "But the government is going to ram it through because, just like they didn't want to hear the voices of those hundreds of people through the wee hours of the morning, they're not interested in hearing our voice either." Horwath briefly left the overnight debate to speak to protesters gathered outside the legislature and told them she was proud to see so many rally to defend charter rights at such an unusual time. "Interfering in ongoing elections has ... a chilling effect on our democracy," she said later inside the house. 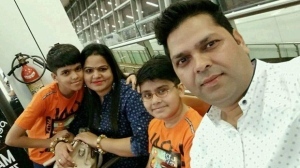 "The reality is this government behaved inappropriately, rammed this change forward without any kind of consultation while the elections were already underway." Last Monday, an Ontario Superior Court Judge ruled that an earlier version of the bill violated the freedom of expression rights of voters and candidates because it reduced Toronto's wards in the middle of an election campaign. Ford said his government would appeal the decision and reintroduce the legislation with the notwithstanding clause, which allows his government to override the court ruling. The premier's use of the notwithstanding clause has been denounced by the opposition parties, prominent Canadian politicians and hundreds of legal professionals. The province has also applied for Ontario's Court of Appeal to stay last week's ruling. That case will be heard on Tuesday and if a stay is granted, it would mean last week's decision will be put on hold until an appeal is heard, and a 25-ward vote would proceed. "All of this is driving more chaos, more uncertainty and more costs," Liberal legislator Mitzie Hunter said of the added confusion caused by the stay application. Green Party Leader Mike Schreiner said the premier's actions have put the municipal election in jeopardy. "This premier has manufactured a crisis by meddling with elections and trampling on local democracy," he said. "The Conservatives are acting with impunity, trying to suspend people's Charter rights under the cover of darkness while Ontarians are asleep. " Evangeline Cowie and Ana Buzdugan, two Grade 12 students from Toronto, had watched the overnight debate for a short time before the public galleries were cleared. The pair said they felt it was important to show their opposition to the bill -- even on a school night. "It's going to send a message that everyone is ready, is prepared to do whatever it takes to go against that decision," said Cowie, who attended with her parents. "History is kind of going to be made today so I feel like it's important to be here, especially for something that concerns Toronto and its citizens so much," Buzdugan added. Frank Griggs expressed similar motivations. 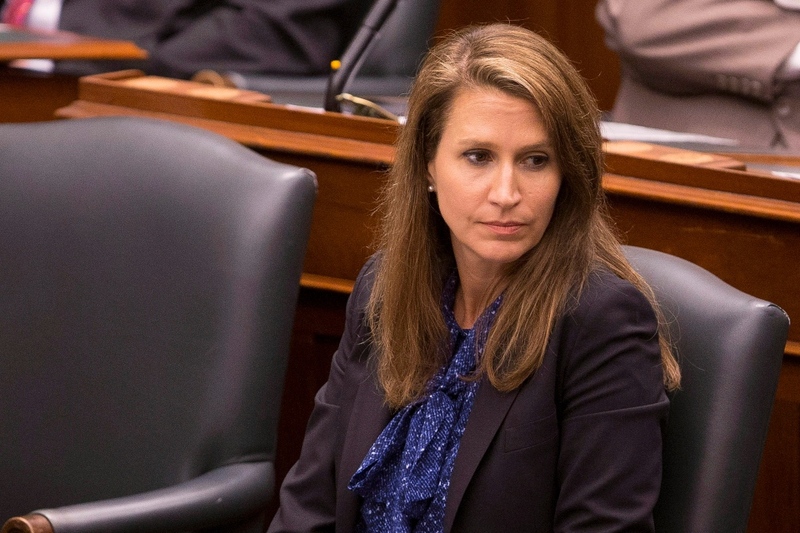 "I hope this sends a message to some of the Conservative MPPs that might at least consider voting against this bill based on the feelings of their own constituents and also just their own sense of decency and their own idea of what democracy should be," Griggs said. The Tory government has maintained that its actions are necessary and within its rights. Last week, City of Toronto clerk Ulli Watkiss said that with each passing day it's becoming "virtually impossible" to ensure a fair election.